The pain is more intense in the morning because your foot have been resting for an extended period of time and you wake up and put all of your body weight on the foot. Over the night, the muscles, ligaments and tendons in your foot have become tight and rigid. Once you apply pressure by standing up, you are stretching them more than they can handle from being so inflexible. Usually, the first steps out of bed are the worse and the pain slowly fades as you walk around. This is because you are allowing your foot to warm up and stretch out. The foot will become more flexible as you walk. There are a few causes of morning heel pain as well as treatment. Morning heel pain is usually caused by a condition called plantar fasciitis. Plantar fasciitis is an inflammation of the ligament that runs from the base of the toes to the heel. 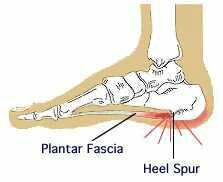 When this ligament, the Plantar Fascia becomes over-stretched and tight it becomes inflamed. A heel spur is when a part of the heel bone grows out of the area causing the bone to stab into the tendons and ligaments in the heel. The pain is more intense in the morning because of the excess weight put on the foot after resting for longer periods of time.